Mexico is a Spanish-speaking country, which means that a company wanting to open a restaurant there would be required to have a bilingual employee to go there and establish a location. This way, the company would have a person to communicate with businessmen in Mexico as well as in the United States. In Mexico, there are 2 million people that speak English fluently. There are 122.3 million people living in Mexico as of 2013, so the firm would need to take into consideration that the ability to be bilingual is essential to its survival in Mexico. The management that the firm hires must be bilingual in order to talk with the population that is overwhelmingly Spanish-speaking; 110 million speak Spanish while 2 million speak English and Spanish. It it highly important that any individual coming from the United States be able to communicate with the majority of the people that live in Mexico. According to the Geert-Hofstede website, power distance is “the extent to which the less powerful members of institutions and organisations within a country expect and accept that power is distributed unequally.” For a restaurant, this implies the importance of control of management and employees. We already know from our presentation on politics that Mexican law makes it difficult to hire and fire employees. A restaurant would have to be carefully managed in order to avoid violation of the hierarchical society that is common in Mexico. The Geert-Hofstede power distance scale gave Mexico a score of 81, which shows that hierarchy of command is very important and not often questioned. In other words, there already exists a chain of command in which people will have to be careful not to overstep the boundaries of others as these boundaries are not questioned in a hierarchical society like Mexico. Another aspect of culture that is highly influential in management in Mexico is that the country is very collectivist, with a score of 30, leaning deeply towards a collectivist way of life. This means that a firm would need to take in consideration how dedicated individuals are to their family. Families come first in Mexico; therefore, in business, loyalty is as important to the firm and its customers, employees, and its relationships as it is to an individual and his or her family. A firm should strategically form relationships that are meant to last a long period of time. Since Mexico is very hierarchical and loyal, it makes sense that the country is rated highly at 82 in uncertainty avoidance. This means that a firm will have to keep in mind that many other firms may be cautious about working with it, only because they have not had a relationship beforehand. This also means that there should be a set of rules to be followed and that it should not be questioned, even if the rules are not followed. For a restaurant, the rules for operations and a management hierarchy would have to be established probably before the firm broke ground on a location in Mexico, so that people know how to expect to behave and how others will behave towards them (so to avoid the risk of breaking cultural norms). Beyond the socially implicit rules that make up Mexicans hierarchical social structure, the rules that dictate government and regulation add another layer maintaining a restaurant in Mexico. According to the Constitution of 1917, the states of the federation are free, autonomous, independent of each other, and sovereign. Meaning each state has its own congress and constitution. Which allows each state to have laws and regulations giving each state complete power of its government. Each state also has its own constitution that cannot contradict the federal constitution, which covers issues of national competence. This could cause problems for young american entrepreneurs if they were planning on franchising a restaurant in Mexico. The business owner would have to determine how to make each restaurant fit into the laws of each state’s governing body given that there completely different laws. I think it would be hard to create a restaurant that unique and different for each state. Although the US and Mexico are so close to each other there are still lots of dissimilarities in both cultures business etiquette,business ethics, and social norms. One thing that I’d like to note about Mexican business etiquette is what they consider to be business appropriate conversations. In Mexico it’s customary to talk about family and personal issues before begin to discuss anything else. Whereas, in the USA people prefer not to discuss family matters and personal lives with clientele. One similar business etiquette that Mexico shares with the US is that men are expected to shake hands when entering and exiting an establishment. Normal when it comes down to making ethical decisions the person who is deemed the most powerful is the one making that decision. If an employee recommends something to their supervisor, the supervisor must first talk to the boss before a decision is made. Mexico’s perception of time is different from USA. Being on time is not strict because of an emphasis on personal obligations. Mexicans embrace the “manana” attitude unlike the United States, who embrace the “time is money” attitude. It’s hard to believe that a country could possible work off a nonlinear timeline. Everything that a company needs to do to become successful takes time. I don’t think that a company can go back and change things from the past. You can try to fix flaws, which will in return try to fix your overall image, but you can’t undo bad business. If that makes sense. Since we live in a real world and not a fairytale world it’s only right to work off of a time linear basis. Which means everything builds on each other step by step. It’s fair to say that any fortune 500 business that is successful was good at that cannot contradict the federal constitution, which covers issues of national competence. High performing businesses are good at being innovative. I think in order for a US businessman/businesswoman to be successful in Mexico it’s fair to say that they would have to be very innovative. Especially when it comes down to fusing the different cultures. Due to the fact that each state in Mexico has it’s own legislature and laws, i feel like it would be best to base your international business off of a polycentrism principle. Base your business ethics off of the different political, social, and financial situations of each region that you have a restaurant in. Taking into consideration Mexico’s concrete institutions such as business etiquette, social hierarchy, and upholding legislature, it comes as no surprise that Mexico scores very low on the “Long Term Orientation” category. This score indicates a value for “time-honoured traditions and norms while viewing societal change with suspicion”. 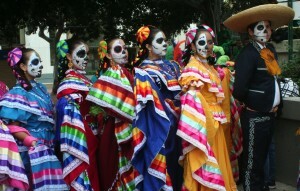 As is typical for many countries that score low on Geert Hofstede’s Long Term Orientation category, religion in Mexico is a very significant contributing factor to the observed traditions and norms present in Mexican culture. 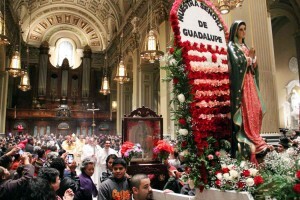 Religion is an especially unifying force for Mexicans due to 83% of the population taking part in Roman Catholicism. This religious identity is rooted in the Spanish conquest of Mexico in the 1500s. However, there were many diverse and well-established indigenous populations (Olmec, Toltec, Teotihuacan, Zapotec, Maya and Aztec) whose religions would be fused and adapted to Roman Catholicism as the conquistadors strived to convert and conquer the Mexican people. Religious traditions in Mexico are not always a matter of mass, good works, and Hail Marys. There are several Christian holidays celebrated throughout the country to honor the longstanding Catholic and indigenous heritage of the Mexican people. These include Epiphany (6 January)(Día de los Reyes Magos), All Saints’ day (1 November), All Souls’ day or Day of the Dead (2 November)(Día de los Muertos), and the feast of Our Lady of Guadalupe (12 December). These holidays are often celebrated are large community events with festivals, music, street food, performers, and dancing. Under the parameters of Geert-Hoftsede’s cultural dimensions, Mexico’s vibrant and lively culture is not only grounded in tradition, but also paired with a score of 97 on the “Indulgence” score making it traditional, religious, and not a little indulgent. This dimension is defined as “the extent to which people try to control their desires and impulses”. Needless to say, Mexicans know how to have fun. The indulgence category relates to spending habits, leisure time, and enjoying life with a positive outlook. When I asked a friend from Mexico how he would define this category, he said it has to do with Mexicans feeling less pressured by time constraints, more willing to throw a big party and invite everyone they know, cook a huge dinner regardless of the cost, etc. And an invite to a Mexican dinner is not something you’ll want to miss. The Mexican education system is a lot more relaxed than the U.S. The school day is shorter and the students are let out for a break/lunch in the middle of the day. Also, its most common for schools to have uniforms. They learn and cover similar material, but the day is shorter and the school year is longer. They have classes from kindergarten to 12th grade, and university as well. Teachers aren’t required to have college degrees. Most teach English as a foreign language, and if the students make it through, are generally bilingual by graduation. School attendance isn’t required by law, and a large percentage of the population doesn’t make it through high school. In conclusion, the cultural dimensions that constitute Mexican daily life and social structure make Mexico a fun, exciting, and inviting prospect for a restaurant to take root in. While special consideration will have to be made for the business etiquette, hierarchical social norms, and the delicious Mexican food you’ll have to compete with, Mexico’s score of 97 on the indulgent scale leaves no question of whether you’ll garner interest as the new restaurant on the block. If your staff is prepared to speak Spanish with a Spanish speaking population of 122.3 million and jump through the hoops of entrepreneurship regulations outlined by the Mexican government, the only big challenges that are left are setting up shop and stocking up for festival days.